What makes a wedding photograph stand the test of time? We all can remember looking through an old wedding album and snickering at the outdated dresses, hair styles and poses. Every album has the bridal party standing in the church in the same configuration: everyone lined up, bridesmaids on the left and groomsmen on the right, with the newly married couple in the middle. Every album has pictures of the bride and groom posed with various members of the family. When you think of modern day photography versus these old photographs, do you picture something different? Are these traditional photographs passé? What makes a wedding photograph stand the test of time? With the development of digital photography, that almost completely replaced film, there are many trends that, over the years, have been popping up in wedding photography. Some deal with the coloring of a picture. Perhaps the person or subject in the photography is in black and white with one particular item still vibrant in color (a somewhat tacky trend of 2003-2006). Maybe the pictures have been airbrushed to the point of erasing all details in the bride’s wedding dress or worse, her face. The washed-out look in photography has become popular in recent years. Unfortunately, modern and trendy practices in photography run the risk of going out of style. They can make the picture seem dated and not natural. Modern and trendy may work for some couples whose personalities mirror a modern, trendy vibe. 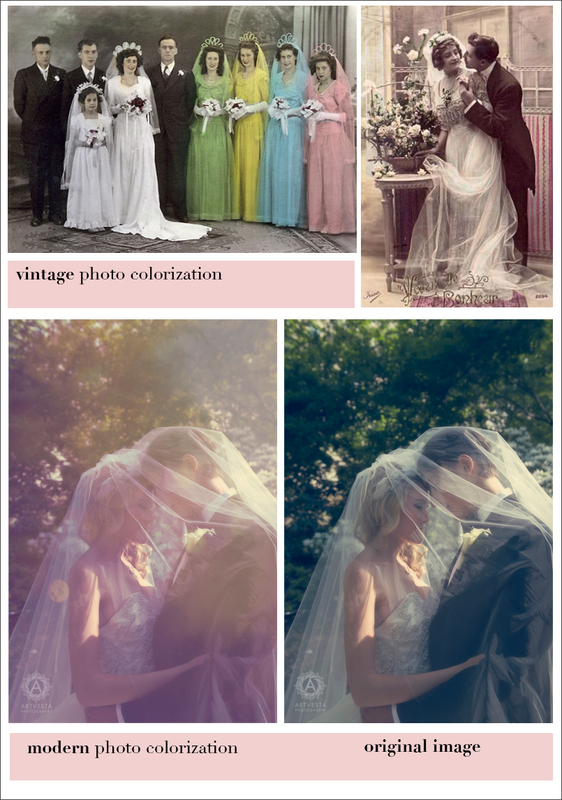 The majority of these trendy looks and effects are added after the original photos were taken and this is the part that, eventually, goes out of style. Therefore, it is a great idea to request your wedding photographer provide you with pre-post production versions of your photos. A wedding photographer should capture the essence of the couple and record the joy of the day. A couple hiring a wedding photographer can ensure timeless wedding pictures by sharing their vision and personalities with the photographer. The pictures won’t ring true if the photographer is trying for an image or effect that is not comfortable for the couple. Some people think many trendy, modern pictures indicate a good photographer. While creativity is nice, having a few clean, magazine quality pictures is a must even for an ultra modern couple. The timeless look of your photos will ensure that they will be well received by future generations. A truly classic, timeless photograph will always look classy and hold its own among the trendier ones.